After a certain amount of silliness on Friday, it became clear on Saturday morning that the Williams-BMWs were (as expected) in a class of their own on the fast blasts of Hockenheim. Juan-Pablo Montoya looked the stronger of the two drivers all weekend a few hundredths of a second faster than Ralf Schumacher. The pair were seven-tenths ahead of their nearest challenger and in F1 terms that is a country mile. The chasers were led on this occasion by Mika Hakkinen who outqualified Michael Schumacher by a tenth. David Coulthard and Rubens Barrichello were next along but they were both a long way off the pace of their team mates. Hockenheim has always been a track which is a great judge of a car and traditionally the teams line up in neat color-coded order. But this year things were a bit more confused than usual. The two Saubers were on row four but the two Jaguars were split by a Jordan (Jarno Trulli). The second Jordan ” which was the talking point of the weekend ” was back in 15th position driven not by Heinz-Harald Frentzen but rather by Ricardo Zonta. The BARs were together and the Prosts would have been together but for Zonta and then came the Benettons, the Arrows and the Minardis. Things did not go to plan at the start of the race. Even before then, Minardi was in a mess with both cars in trouble and the very sorry sight of the two black cars sitting side by side in the pit as the grid formed up. It makes little difference to Minardi whether they start at the back of the grid or in the pitlane. In fact on this occasion it was probably better to be in the pitlane given the mess that occurred a few seconds after the red lights went out. It went like this: the two Williams went away well as they often do. Hakkinen and Schumacher (M) seemed to be doing OK until suddenly the Ferrari slowed. "I had a problem with the gear selection," said Michael. "And I didn't know where to go. I saw Burti in my mirrors and I couldn't move out of the way." Burti had not been able to see the slow Ferrari because Panis was in his way. The Frenchman swerved at the last moment, having only seen Schumacher at the last minute because his view had been obscured by Zonta. The chain reaction left Burti with no time to do anything. "It happened so fast," explained Luciano. "When I saw him it was too late to avoid the crash." Burti braked as hard as he could but the Prost ran into the back of the Ferrari and was launched skyward, shedding bits and pieces as it did so. The entire car went over the top of Enrique Bernoldi's Arrows and almost landed on top of the similar car being driven by Jos Verstappen. Both cars were showered with wreckage. "I think I was pretty lucky," said Bernoldi. "A wheel landed on my car and broke the engine cover and the rear wing. It was a pretty big hit." Burti's car ended up the right way up and then it bounced across the gravel trap and hit the barrier a hefty blow but Luciano was out without drama, although it later emerged that he had hurt his left arm slightly. Schumacher too was unscathed but the track was a mess. There are some who would argue that such an incident did not warrant a red flag but in truth that would have been a risk that was not necessary. Small shards of carbonfiber can cause disastrous tire deflations at a high-speed track such as Hockenheim and the red flag was the wisest course of action. It helped Michael Schumacher and Luciano Burti to get back into the race but it was better that way than having to deal with an even bigger accident later in the day. "The track looked a bit like a battlefield," said Michelin's Pierre Dupasquier. "It would have been dangerous not to stop the race because you do not want tires picking up pieces of carbon shrapnel when the cars are travelling at 350kmh. Debris like that tends to be razor-sharp and work its way slowly into a tire before causing it to puncture. The race director did the sensible thing." And so the race start process began again and this time there was a full grid. Once again Montoya beat Ralf Schumacher away and off Juan Pablo went. Ralf was comfortable in second while the battle for third place was lively indeed in those wild early moments of the race. Hakkinen, M Schumacher, Coulthard and Barrichello was the order going out of the stadium but by the time the cars reached the exit of the Ostkurve at the far end of the track Michael had sliced ahead of Mika. On the run down to the stadium Barrichello pulled off an audacious outside overtaking maneuver on Coulthard to steal fifth. It was good stuff. As the Williams-BMWs went away at the front (and Montoya went away from Ralf) the battle raged on. Barrichello clearly had an advantage and it was pretty safe to assume that he had decided to run a light fuel load and go for a two-stop race. 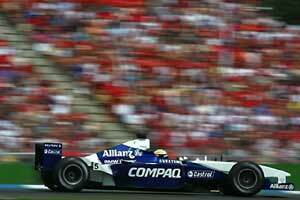 On the third lap Rubens overtook Hakkinen at the Ostkurve and on lap six he overtook Michael Schumacher himself. "The two Williamses were on another level," he said. "I think that the best I was hoping for or could achieve was third because they were really fast. I was the only one on their pace to start with." The rest of the pack was somewhat disjointed because of another incident on the first lap where Pedro de la Rosa made a mistake and slid into Nick Heidfeld's Sauber at the first chicane. Both men were knocked out. "We all make mistakes," said Pedro. "Today it was my turn." At the front it was very clear that Ralf Schumacher had no answer for Montoya's pace. "When Juan Pablo pulled away I thought: "OK, you do whatever you want to", Ralf explained. "I already started to save the engine because I know how long and how hard this race is." By lap 22 ” half distance ” Montoya had built himself a lead of 10 seconds. And Ralf was nearly 20 seconds ahead of his nearest challenger. The advantage was around a second and a half a lap. All Montoya had to do was have a good pit stop and then maintain his advantage to the flag. But that was not what happened. The refuelling rig worked fine except that the signalling lights stopped working. The refueler thought that not enough fuel had gone into the car and so took the decision to switch rigs and make sure. That meant that not only was 20 seconds lost but also Montoya was sent out with a much bigger fuel load than he needed. But even with the misfortune Montoya looked to be set for second place. Barrichello was ahead but he was going to have to pit again. And then Juan's engine failed him. "I am so disappointed that I cannot find the words to describe how I feel," he said. There was a lot of sympathy for him but sympathy is not enough for a man like Montoya. He wants results. After Montoya was gone it was all fairly simple for Ralf. And his victory was an accomplished one. "To win here with a German package, a German driver in Germany, it's the perfect scenario," he said. One can only wonder what those well-known Germans Frank Von Williams and Patrick Von Head had to say about the all-German package from their headquarters in Oxfordshire but one can perhaps forgive Ralf for getting a bit carried away by it all. He said the right thing in the right place ” which is a well-known Schumacher trait. Michael Schumacher was about 15 seconds behind Barrichello when the World Champion rejoined after his stop. It is possible that Michael might have been able to take second (Ferrari team orders might have taken care of it) but it became an irrelevant point because as he accelerated off after the pit stop his Ferrari V10 stopped with "a fuel pressure problem". So Barrichello took second and was happy with that. It was not easy. After his first pit stop on lap 16 he fell behind David Coulthard again and once again the Scotsman did not make life easy for him. But on lap 20 Rubens went around the outside again at the corner going into the stadium. "You have to be a bit audacious," he said. Third place was a much bigger surprise because no-one would have bet on Jacques Villeneuve getting onto the podium ” least of all Villeneuve himself. "We haven't been competitive in the last few months and this was probably the race we expected to be least competitive in," he said. "It's great that we got another podium but we still need to be more competitive." Olivier Panis went for a different strategy to Villeneuve and it did not really pay off. "I thought two stops would be a better option," he said, "but it did not work out." Panis looked good early on (as two-stoppers tend to do) and he went from 13th on the grid to sixth when he pitted on lap 16. But the stop put him back to 11th and all he could do was finish seventh. The important thing for the BAR boys was that for the first time this year the team has moved ahead of Jordan in the battle to be the top Honda runner. Just behind the two Benettons was Jean Alesi in what could well be his last race with the Prost team. Jean was driving with usual verve and after a rather poor start he raced as one would expect him to do. Flat out all the way. From 18th at the end of lap one he moved up to fifth before he pitted on lap 25. He dropped back to ninth but as others went out so he moved back to sixth to score again. Burti raced in the spare after his flying display but he dropped gradually back because of a problem with his arm and in the end he went off because of the pain. "I simply could not drive any longer," he said. A lap down at the end in eighth and ninth places were the two Arrows, although in the late stages of the race it looked as though Verstappen and Bernoldi might actually wipe one another out as they diced for the place. Technical director Mike Coughlan remarked later that some of the maneuvers were "a little too close for comfort". Still the team got two cars home. It was something, particularly given the fact that Verstappen had to pit having collided with Zonta early on. Then things settled down until Alonso's second pit stop on lap 24 when there was another problem with the refuelling valve and he left the pits with the afterburner on (fortunately the flames blew themselves out as he accelerated away). After that he plugged away and made it to the flag in 10th place. Marques chose a one-stop strategy and his race ended when he pitted with a gearbox failure. Four teams failed to get a car to the finish with Jaguar leading the way in wiping out. After de la Rosa's demise on lap one, Eddie Irvine looked to be in a quite useful situation, running along in eighth place. But then on lap 18 he suffered a misfire and that was that. "We should have scored some points today," said Irvine. Sauber's race was not much better. After Heidfeld was knocked off by de la Rosa, Raikkonen was running in seventh place. But on lap 16 he suffered a driveshaft failure. "I made it to the pits but there was nothing more I could do," he explained. McLaren had another bad day. Outpaced by both Williams and Ferrari, Hakkinen and Coulthard ran fifth and sixth early on but on lap 14 Hakkinen's engine went boom and that was the end of his day at the races. Coulthard kept on going and by the time he stopped he was up to third and looking good for a podium. But as he accelerated away from the pits his engine went boom as well. "Our World Championship chances are now minimal," admitted Mercedes-Benz's Norbert Haug. Jordan also ended the day with no points in the bank. Zonta collided with Verstappen in the course of the sixth lap and had his nose removed. He pitted for repairs but the damage was too great and Ricardo retired after one more exploratory lap.